Statewide, the graduation rate set a record last year of 87.5 percent. 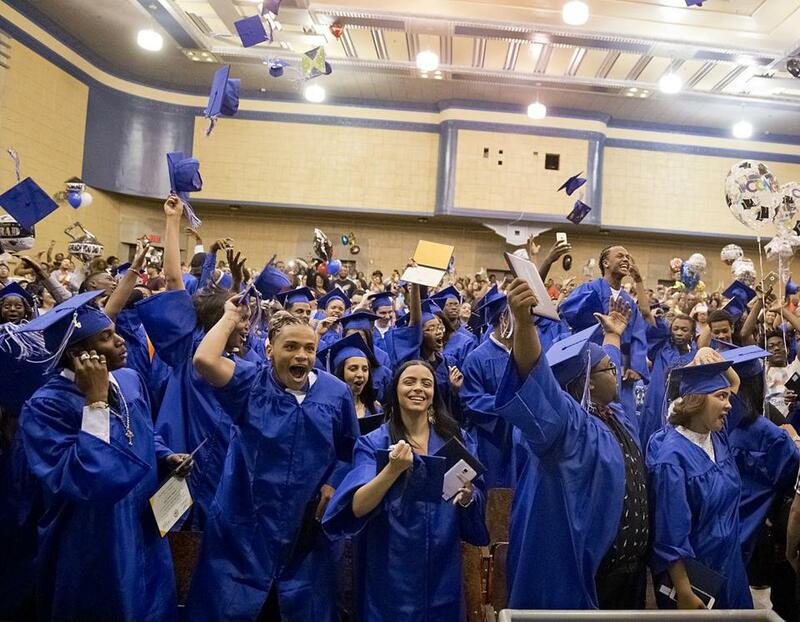 MALDEN — After years of struggling with low graduation rates, Boston has made dramatic gains in helping high school students obtain their diplomas, according to state data released Tuesday. A decade after only 59 percent of those in Boston’s public schools graduated within four years, the rate rose to a new high of 72.4 percent in 2016. The increase was pronounced among black and Latino students, gains of 13.6 and 16.5 percentage points, respectively. Statewide, the graduation rate also set a record last year of 87.5 percent, up from 87.3 percent the previous year, and the gaps in graduation rates among students of different backgrounds statewide narrowed over the 10 years, according to the data. Education advocates were encouraged, saying the figures reflected persistent efforts by Boston and other cities to keep students from dropping out. Employment options for students who don’t complete high school have dwindled in recent years. Sullivan said Boston’s schools have done a better job of using test scores to measure skills and then individualizing instruction. Under those changes, lessons better reflect students’ academic abilities and minimize teaching that’s either too fast-paced or not challenging enough. School officials also try to re-enroll students who have dropped out, employing outreach workers at the district’s re-engagement center to persuade them to return to class, he said. In some cases, officials may suggest that students try a different school within Boston Public Schools or vocational education programs, which have been established in nine city high schools, he said. “Our goal needs to be a zero percent dropout rate and 100 percent graduation rate,” Sullivan said. Lawrence is a another city that has made substantial progress, as its graduation rate climbed from 52.3 percent five years ago to 71.4 percent last year. Its approaches include offering dropouts access to online courses and guidance counselors as they work to place them in a school. Leldamy Correa, director of strategic initiatives for Lawrence Public Schools, identifies students who may be at risk of dropping out early and works to keep them in school. For students who drop out, Correa sends letters informing them they’re welcome to return. Those letters are mailed at three different times: between November and January for students who could return for the second semester; March and April for summer school enrollment; and over the summer for the new school year, Correa said. Some students who drop out don’t know they can come back, she said. When she meets with them about resuming their studies, Correa said, she asks why they left — not to hold it against them, but to make sure those factors don’t drive them away again. “We need to make sure that we’re looking at every student and making sure we’re giving them opportunities to stay in school,” she said. Some older students who have fallen behind may enroll in Lawrence’s High School Learning Center, which offers more flexible schedules, including online courses, Correa said. The school system is also planning to expand opportunities for students to get career training or enroll in college courses at Merrimack College or Northern Essex Community College, she said. In Brockton, where the graduation rate rose from 69.4 percent five years ago to 79.1 percent, Deputy Superintendent Michael Thomas credited alternative high schools like Edison Academy, which offers night classes, and Frederick Douglass Academy, a school for students with behavior problems. The alternative high schools, he said, have a lot of public support. “They have to help push these kids back into schools,” Thomas said. The district has invested in vocational programs to prepare students for jobs as medical interpreters, certified nursing assistants, and in food services, he said. Outreach workers visit students who leave school or have been absent for long periods and try to get them to return to complete graduation requirements. “We’ll go after these kids to get them back even if they just have to come back and take the MCAS,” Thomas said. State officials presented the new data at the monthly meeting of the state Board of Elementary and Secondary Education in Malden, shortly after posting it online.